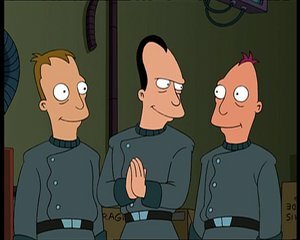 Igner is the youngest and dumbest of Mom's sons, and the only non-clone offspring of Hubert Farnsworth. As the dumbest of the three, he is often prone to slapstick events, and unquestioningly does what his brothers ask him to, but he is also the one with a sincere heart. While Igner is the dumbest of Mom's sons, and often does what he is asked without thinking, he can actually do the right thing when he puts his mind to it. While dumb, he is actually sincere and good at heart, something which cannot be said about his oldest brother, Walt. Although neither of the brothers is as evil as their mother, Igner is the only one to question and sabotage for his brothers. Mom got pregnant in the mid-to-late 2970s (see age), while still seeing Professor Hubert J. Farnsworth, who she later broke up with. She decided to keep the baby, who would later be named Igner, without telling the Professor, and it wasn't until Igner was a grown man that the Professor first learned about his son. At Igner's birth, Mom flipped a coin whether to keep her son or the afterbirth, but ultimately kept her son. Igner grew up assuming that he shared father with his older brothers, Walt and Larry, as their mother never told him otherwise. Along with them, he later started working for Mom in Mom's Friendly Robot Company. In 3008, Igner eavesdrops on Mom telling his brothers about his secret father. By the Planet Express attack on the Mombil "mine", he helps the Planet Express crew to flee instead of capturing them, as he had been ordered, leaving the PE crew pleased but puzzled. Later on, he tells Farnsworth about him being his father, and he helps the crew destroy the anti-backwards crystal and effectively the usage of dark matter as fuel, and thus disobeying his family for the sake of righteousness. According to Mom, Igner has never been hugged, until Farnsworth requested it. Igner was originally thought to be spelled as "Ignar". Igner's name could be a pun on the insult "ignoramus". His name is still spelt as "Ignar" in the Comics. Igner often whimpers in fear of certain events, such as when Farnsworth were to get Mom's remote in her bra. In "The Farnsworth Parabox"'s universe 1 Igner would have been abandoned by Mom as she flipped a coin to keep him or the afterbirth, and the parallel universe has reverse coin flips. Mom: When he came out I flipped a coin whether to keep him or the after-birth. Walt: Yes, Mother. You told that story at his graduation. ^ Commentary for "Leela and the Genestalk" on Volume 8, disc 2. This page was last edited on 31 August 2014, at 19:46.